Warning: The Wikipedia page, http://en.wikipedia.org/wiki/Victor_Turner_(civil_servant), which stated his dates as 1906-1998, contained serious errors. I have recently (10 September 2012) edited the page so that his dates are 1892-1974 and corrected other errors. Two early pictures of Alfred Charles Turner, both by Cambridge photographers. 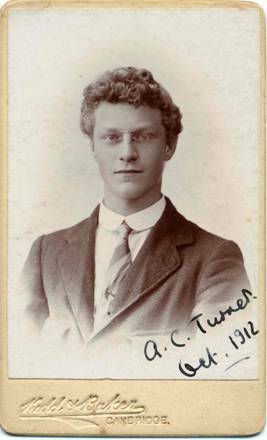 Alfred Charles Turner was born 12 March 1892 at 36 Campden Street, in the sub-district of Kensington Town, London to Walter Charles Turner (a butler) and Annie formerly Searle1. In the census of 1901 he was living with his mother and brothers at 36 (assumed Camden Street) aged 9 and born in London. In the census of 1911 he was living with his parents and brothers at 36 Campden Street, Kensington aged 19 and born in Kensington. He was educated at St Mary Abbotts Higher Grade School, Kensington, from 1896 to 19042 and then went to Latymer Upper School in Hammersmith. 1n December 1910 he gained a Cambridge Open Scholarship to read Mathematics at Emmanuel College, Cambridge (worth £40 a year for 3 years), and was also supported by a School Leaving Exhibition (worth £30 a year for 3 years) and a L.C.C Senior Scholarship (worth £80 a year for 3 years). He went up to Emmanuel College, Cambridge in October 19112. Whilst there, he rowed for Emmanuel II4. He spent the usual three years at college and obtained a First in Part 1 of the Maths Tripos in 1912 and was a Wrangler in Part 2 in 19142. He took his BA in 1914 and his MA in 19182. 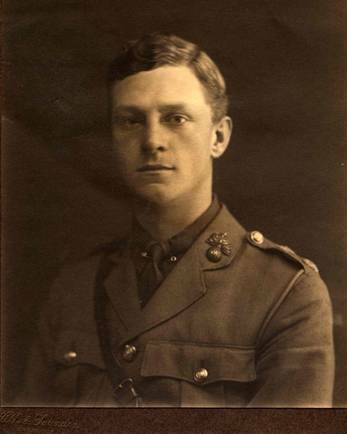 During the First World War Alfred served with the Royal Fusiliers2. There is a medal card for Alfred Charles Turner, lieutenant and captain, Royal Fusiliers, at the PRO. It records that he first entered the theatre of war in France 9 August 1915 and applied for his medals 5 April 1921 (Victory Medal and Star Medal). His address then was Sitapur, Gorakhpur (near the border with Nepal), Uttah Pradesh, India. Alfred married secondly, in 1927, Gladys Blanche Hoskins (2nd daughter of Francis Gerald Hoskins of Haywards Heath9). She was known as Gail Bridget, was born 1903 and died 19 June 1994 in Seaford8, by whom he had a son and a daughter6. The marriage was dissolved in 19506. In 1941 he was appointed by the Government of India to be additional Secretary of the Finance Department at Delhi.6 Towards the close of 1945 he was made Financial Commissioner for Railways.6 Early in 1947 he returned to the Finance Department as Principal Secretary6, was knighted at the Viceroy’s House, New Delhi, 18 July 1947 and took the additional first name of Victor6, 11. A few months later, on the transfer of power from British hands, the newly formed Government of Pakistan appointed him Secretary of the Ministry of Finance. He served as the first ex-officio chairman of the Federal Board of Revenue, Pakistan, 14 August1947 to1 February 195012. Work in Sir Victor’s department in the new Government of Pakistan was particularly stressful with almost no resources and with the loss of much of the workforce in the mass migration to adjacent Indian provinces and in the filling of vacant posts by Muslim refugees from India. Very quickly however order was established and the Finance Minister, Chaudry Mohamed Ali, owed much to Sir Victor’s flair for organisation and administration6. The first currency notes issued by the new Government bore the signature of V. A. C. Turner6 (the green 1 Rupee 3rd issue, 1st state bank issue, 1 March 1949 and the blue and purple 1 rupee 1952/3). There is a reference in the collection of Mountbatten papers at Southampton University to Sir Victor Alfred Charles Turner, MBE, Secretary, Ministry of Finance, Government of Pakistan 1947. In 1950 Sir Victor returned to London to be Financial Adviser to the High Commissioner of Pakistan.6 In 1954 he became Economic Adviser to The De La Rue Co Ltd and retired in 1964.6 He was treasurer of the Pakistan Society, from its inauguration 16 January 1951 to 196913, and attended a large number of dinners, receptions, memorial services etc, that were reported in The Times, Court and Social section, sometimes representing the High Commissioner of Pakistan. Sir Victor married thirdly, 7 May 1957 at Kensington, Winifred Bessie Howarth (died 2 March 1997, daughter of the late C.H. Howarth). He was of Brasenose House, 35 Kensington High Street, London W8 (part of property owned then by Brasenose College, Oxford) and she was of 22 Bina Gardens, London SW5.14 There were no children of this marriage. His recreations included fishing, shooting etc., and his addresses were 4 Windacres, 27 Warren Road, Guildford15 and Gate of Derry, Wonersh, Guildford16. 1. General Register Office certificate of birth. 2. Personal communication, the archivist of Emmanuel College, Cambridge, 2 Nov. 2004. 3. Admissions register, Latymer Upper School, Hammersmith, London. 4. Inscription on a photograph in the private collection of David Johnson. 5. Lambeth Palace Library, Bell/184-368/190/131-4. 6. Obituary, The Times, issue 59220, 17 Oct.1974 p. 18. 7. General Register Office certificate of marriage. 9. Burkes Peerage, Baronetage and Knightage, 4th ed. (1970) p. 3187. 10. London Gazette, 15 Nov. 1938 p. 7228. 11. London Gazette, 29 Aug. 1947 p. 4092. 14. The Times 26 Feb. 1957 and 8 May 1957. 15. Who Was Who 1971-1980 Vol. VII. 17. General Register Office death indexes.